A Fusion Middleware WebLogic domain created via WebLogic's standard Configuration Wizard does not include the Fusion Middleware Control or Java Required Files (JRF). New Managed Servers and/or Clusters created via the WebLogic Administration Console (Managed Servers and Clusters created via Fusion Middleware (EM) Control will have JRF deployed). 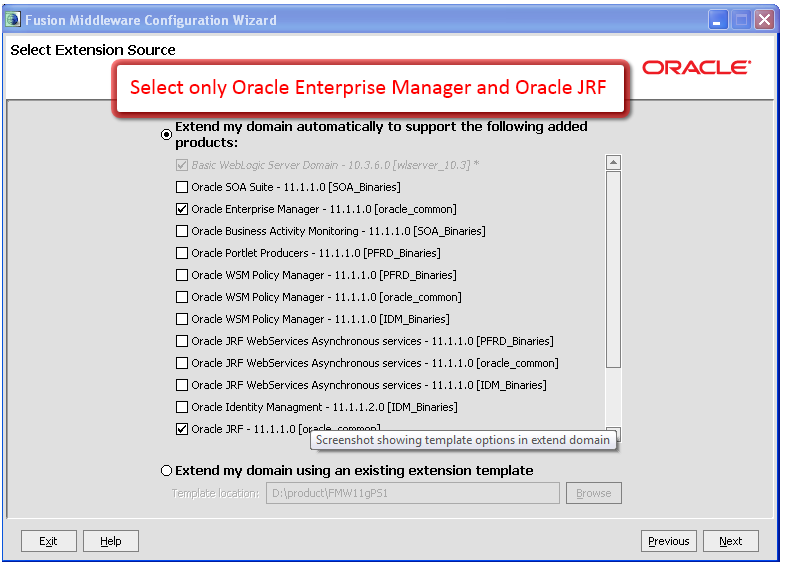 Oracle Fusion Middleware products, such as SOA, WebCenter, IDM, Portal/Forms/Reports/Discoverer, apply JRF, by default, at domain creation time. If you do not wish or have no requirement to install the binaries for these install types, then you can create the "oracle_common" directory and its contents by using the installer for Oracle Middleware 11g "Application Developer" - also known as Oracle Application Development Framework ( ADF ). The ORACLE_HOME created by an install of ADF is "MW_HOME/oracle_common"
Download one of the Oracle Fusion Middleware 11g Release 1 install types that provides "oracle_common". b) Pick the 11g Release 1 (11.1.1.x) readme which corresponds to the version of Oracle WebLogic Server in the Middleware Home. c) Find the download links in the section labelled "Downloading Oracle Fusion Middleware Products for a New Installation"
If all you want to do is install / configure Enterprise Manager Fusion Middleware Control, download "Oracle Application Developer" - also known as Oracle Application Development Framework ( ADF ). 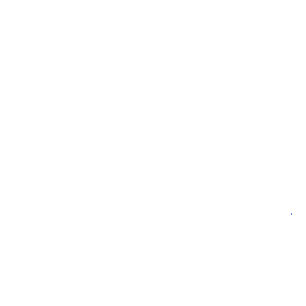 See Installation Guide reference in section above "The Oracle Common Directory". Choose to "Install Software Only" (Do Not Configure). Doing so will create the product ORACLE_HOME and the Oracle Common directory. Oracle Application Development Framework ( ADF ) will only lay down the oracle_common directory. The oracle_common directory is the ORACLE_HOME for ADF. 2. If you have not already created a WebLogic Domain then choose "Create a New Domain". If you have already created a WebLogic Domain via the standard WebLogic configuration wizard then choose to "Extend an Existing Domain"
3. The Configuration Wizard will then give you options as to what you want the domain to contain, for example see screenshots below. 4. Continue through the configuration screens and create or extend the domain. The file should contain the property setting StartScriptEnabled=true. Failure to set StartScriptEnabled to "Yes" may result in broken java applications and functionality. 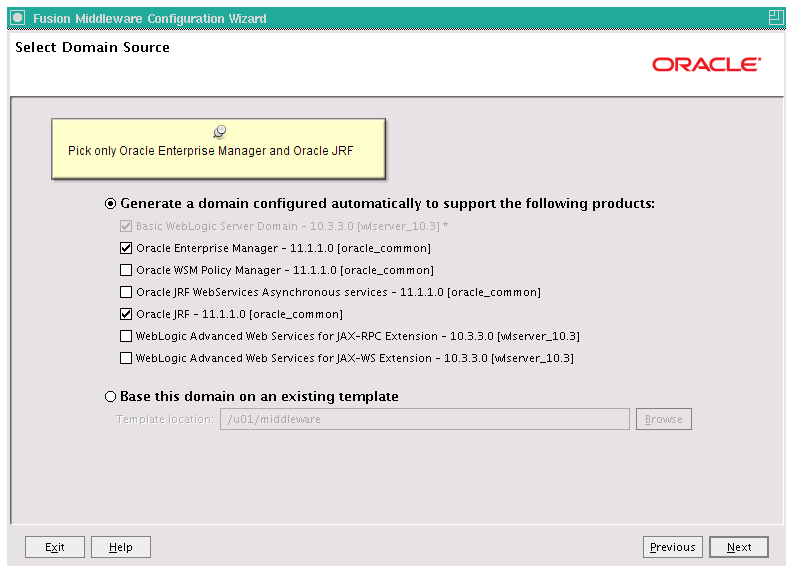 Provided you only select JRF and Enterprise Manager in the Configuration Wizard there is no need to run the Repository Creation Utility (RCU) against an Oracle Database to create Middleware product schemas. 6. Starting the servers in the domain post creation or extension will initiate and deploy the chosen Enterprise Manager and/or JRF components. The Enterprise Manager application will only be deployed to the domain's Admin Server. JRF will also be deployed to the domain's Admin Server, but depending on the path taken, it may be necessary to apply the JRF to the managed servers. See next section for more information. 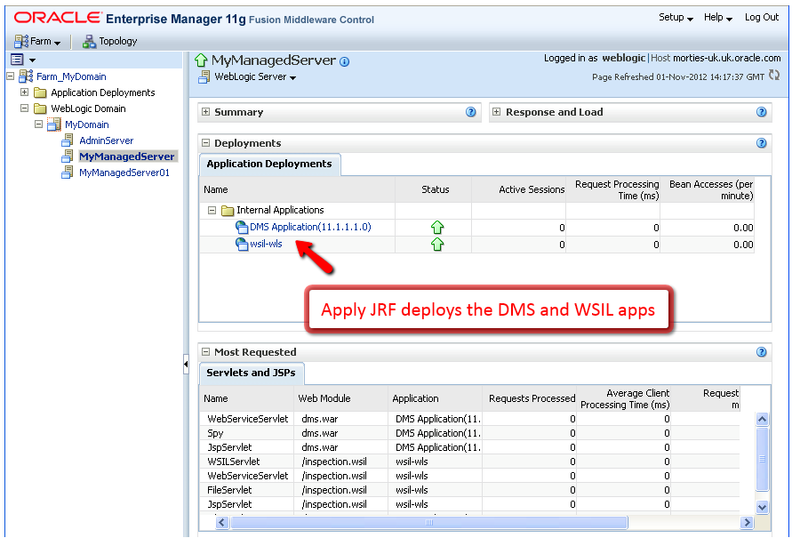 If DMS Application and WSIL-WLS applications are not deployed, JRF has not been applied to that managed server. Check the application deployments via Oracle Fusion Middleware (EM) Control. If DMS Application and WSIL-WLS applications are not deployed, JRF has not been applied to that managed server. Figure 3 : Fusion Middleware (EM) Control - Is JRF applied? 2. Oracle JRF includes the applications and code which enables Fusion Middleware Diagnostic Framework and Repository (ADR). A combination of the Oracle WebLogic Server 10.3.6 Upgrade Installer and Oracle Fusion Middleware Patch Set (11.1.1.6 or higher) patches the ADR version to 11.2.0.2. This version of ADR allows Remote Diagnostic Agent (RDA) output to be included as part of an incident package. In particular these chapters are useful when it comes to understanding the steps for installing / upgrading the core technology stack.